Last week, researchers announced the discovery of the largest four-winged dinosaur ever found. Now the gifted paleo artist Emily Willoughby has created this lovely image of Changyuraptor yangi, where you can clearly see its "leg wings." Changyuraptor yangi is a newly-described microraptorine dromaeosaur dinosaur from the early Cretaceous (Yixian formation) of Liaoning, China. The animal would have been around 4 feet long in life, and its fossil shows that it was covered in feathers — including, as in its smaller cousin Microraptor, a pair of "leg wings" represented by long paired pennaceous feathers on the metatarsals and tibiotarsus. 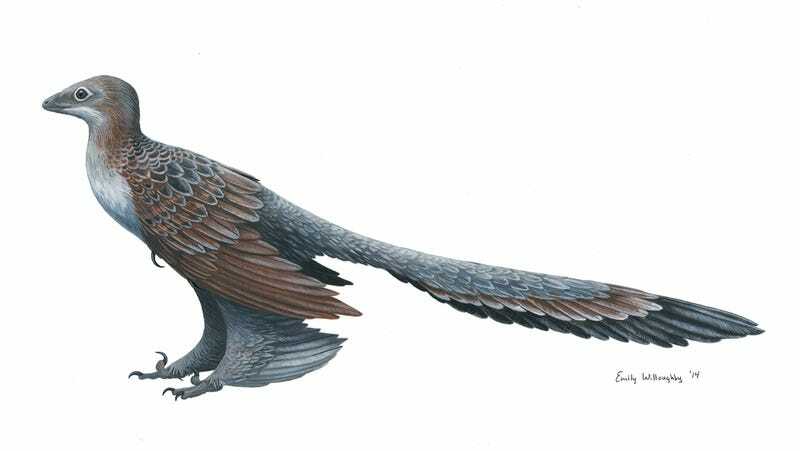 One of Changyuraptor's most unique features is its voluminous tail feathers, and these feathers constitute the longest of any known non-avian dinosaur, with the most distal retrices reaching around 30 cm in length. Changyuraptor is also by far the largest "four-winged" dinosaur known, and while this might not be as big of a deal as it sounds (given that there aren't very many "four-winged" dinosaurs), it does show that small size wasn't necessarily the gatekeeper to certain volant adaptations.